Forget the Pet Rock, the TV Rock is actually entertaining. This piece of Ulexite AKA hydrated sodium calcium borate hydroxide AKA Television Rock naturally projects an image of whatever is placed below it on its surface. 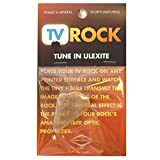 The unique tiny fiber structure of Ulexite acts like fiber optics, which allow them to transmit light all the way through by internal reflection. 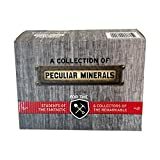 Makes a unique and interesting gift or stocking stuffer.